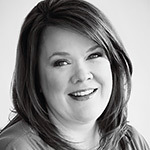 Kristina Gaughran is a Hallmark Senior Artist for Hallmark. She has been doing ornament designs since 1995. Kristina has designed the Fairy Messenger series as well as the Carousel Ride series. In addition she has done several of the Star Wars ornaments.